Don’t have a room or basement to convert into a wine cellar? At Vigilant, we believe there are plenty of options in your home to acheieve the perfect wine storage solution. Some examples are: coat closets, under the stairs spaces, pantries, hollow wall spaces, and more! Let us know the dimensions and size of your wine collection and our experts will work together to create a functional and stylish design that you'll want to show off to all your guests. If your space needs customization, we can do that. We are the manufacturer and can help you achieve the perfect wine storage solution to accommodate your space and your style. If you don't see a standard option that works for you, just ask us, we can help! 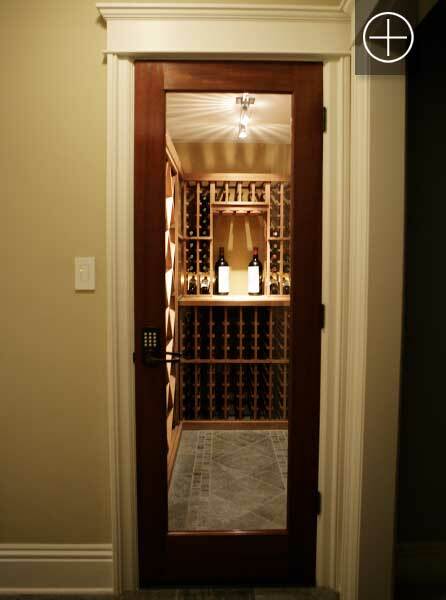 Request Your FREE Wine Closet Design Today! Call our knowledgeable wine room experts to discuss how we can help make your dream wine storage a reality. Convert your unused closet into a functional wine storage closet. 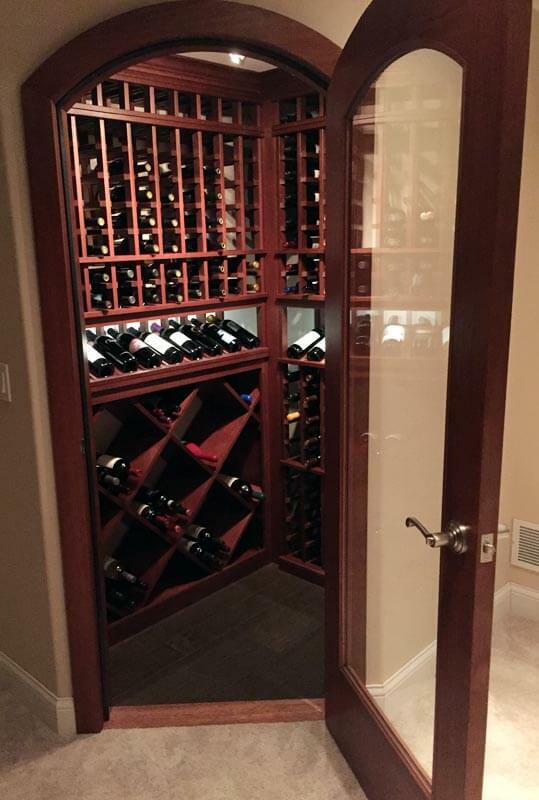 This wine closet was designed for a home in Maple Valley, Washington with a through-wall wine cooling system. Vigilant built custom wine racking to extend all the way to the 9-foot ceiling within the closet. The wine cellar was made from Mahogany wine racking finished in Vigilant’s Espresso stain and matte lacquer. It also features Burgundy ladder racking, Magnum racking, diamond bin storage and a segmented quarter round display. The focal point of the closet is the beautiful and functional beadboard arch above a tabletop. REQUEST YOUR FREE CATALOG REQUEST YOUR FREE DESIGN TODAY! This homeowner transformed the extra space under their stairs and turned it into a beautiful wine room. Through a Vigilant Full Glass Square Door and sidelights, the wine room is an eye-catching focal point in their living room. The wine room features a tabletop encompassed by a decorative beadboard arch, ladder racking with a display row and label forward metal wine racking. Keeping the wine in the perfect storage condition is a ducted cooling system with an integrated humidifier. This homeowner built their own wine storage room in an unused corner of their basement. He framed, insulated and dry walled the closet to create the perfect environment. The wine closet features Vigilant mahogany ladder racking and diamond bins that can hold up to 355 wine bottles. For temperature control, the closet utilized a through wall, self-contained cooling system. Lastly, the wine closet is sealed behind a Vigilant classic full glass arch door made from mahogany and insulated glass. Read our blog, "DIY: Make Your Wine Room a Reality" to learn more about this project. We worked with RWT Design & Construction of Burbank, CA on this under-the-stairs wine room. A gorgeous Vigilant mahogany full glass square wine cellar door with two 15-inch sidelights, border glass etching, fluted casings and crown molding with a keystone subtly brags about the wine room contained behind its locked, insulated door. This walk-in wine room conversion makes use of a previously underused walk-in closet and functions well as a wine cellar alternative.